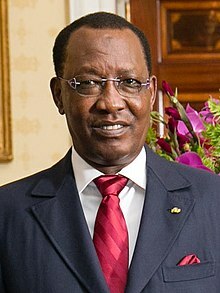 General Idriss Déby Itno (إدريس ديبي) (born 1952) is the Preses o Chad an the heid o the Patriotic Salvation Muivement. Déby is o the Bidayat clan o the Zaghawa ethnic group. He addit "Itno" tae his surname in Januar 2006. This page wis last eeditit on 22 Februar 2018, at 03:40.